provide an ongoing supply of sand to the southern Gold Coast beaches. 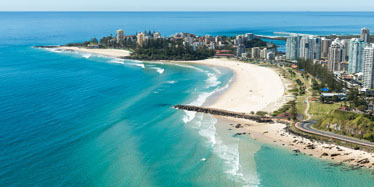 After being extended in the 1960s, the breakwaters at the entrance to the Tweed River trapped and reduced the supply of sand to the southern Gold Coast beaches. This sand normally would have been transported to southern Gold Coast beaches by wave action and near-shore currents. Eventually, the sand moved past the end of the breakwaters and created a large, shallow sand bar at the Tweed River entrance that was hazardous to navigation. The Tweed River Entrance Sand Bypassing Project aims to overcome these problems. We are undertaking the project in 2 stages. 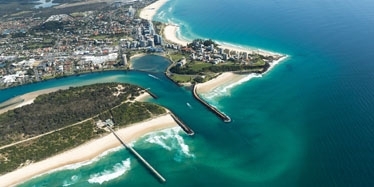 The first stage, now complete, involved dredging more than 3 million cubic metres of sand from the Tweed Bar and entrance to create a navigable channel and to nourish the southern Gold Coast beaches. We delivered sand onto the eroded beaches to bring them back to a condition similar to the one before the breakwaters were extended. The second stage has provided a permanent sand bypassing system since 2001. Sand arriving at the permanent system on the southern side of the Tweed River entrance is trapped and pumped to the southern Gold Coast beaches. sand pumping occurs primarily at night, except under specific conditions such as system testing or storm events—during which, there may be continuous operations. When outlets are operating, you should keep clear for safety reasons. We involve the local community in the Tweed River Entrance Sand Bypassing Project through regular consultation. This includes feedback on feasibility studies to improve project operation. Information on the project is provided to the community in an open forum through regular meetings. The most recent presentation is available at the Community Advisory Committee page of the New South Wales Government project site. In July 2009, the Queensland and New South Wales governments announced feasibility assessments would be made to improve the long-term operation of the project. 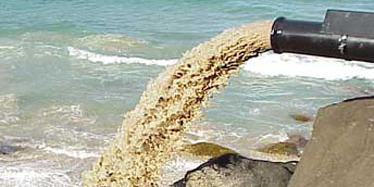 sand back passing—develop a dredging and/or pumping regime to allow sand to be recycled to southern Letitia Spit. In 2011, the findings of these feasibility studies were released for community consultation. Based on the feedback received, the New South Wales and Queensland governments decided to investigate options 2 and 4. View the feasibility studies reports on the New South Wales government project site. Watch the video about the Tweed River Entrance Sand Bypassing Project.